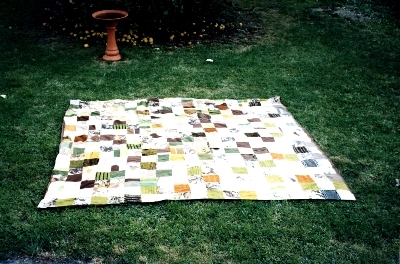 150mm squares of old material scraps, mostly cotton, including some curtain material. There is no padding and the backing is brown lawn. This quilt was made in the early 1960s by Marie Thomas and is still owned by her. It is not used. Marie Thomas made the quilt for their bed from old material scraps she already had. Marie wrote that they badly needed a bedspread but couldn't afford to buy one.